An advertising campaign for a new line of fine-tipped pens has proven how fine they really are by giving Lego people tattoos. It seems like a tattoo would be really hard to engrave even on a normal sized person. 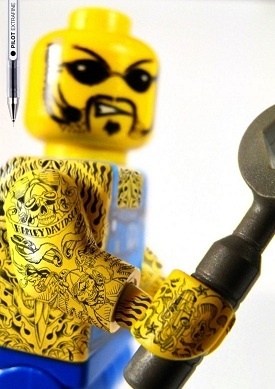 That's why I'm so amazed by the intricate tattoos featured in a pen advertisement, which are extremely detailed considering that they're drawn onto Lego people. A Lego person is a couple of inches tall on a good day, so it's not exactly easy to draw a dragon, skull, or Harley Davidson logo on the arm of one. Seemingly, that's just what Barcelona's Grey advertising agency did to promote a line of Pilot's extra-fine tipped pens. These tattoos aren't simple either, so if they were really drawn on with pens, they're amazing. Even if they weren't, tattooed Lego people are way cooler than non-tattooed Lego people. The series of six Lego person images can be found here. As far as creativity in advertising goes, this is at the top of my personal list. I mean, come on, anybody that gives a Lego person a tramp stamp should be patted on the back and wholeheartedly commended.